tl;dr: Developers’ salaries vary greatly around the world. Here’s a peek into how far incomes differ and what variables skew them. It’s a good time to be a software engineer. The job may involve long hours in front of a screen, but for many developers, the intangible rewards of building things, and the intellectual challenge that comes with the work make it worthwhile. It is also no secret that people who write code for a living are well compensated for their work. The question then becomes how much money software developers make and what factors influence their compensation. Today, we’re going to take a crack at getting close to the answer. Where’s All The Salary Data At? Salary data is difficult to come by. Certain companies, most notably Buffer, are radically transparent with their salaries, but that information is usually private. Other data sources are difficult to use as well. For example, H1-B visa data is public and openly searchable, but is limited to the US and does not provide much context on job applicants. There are also job boards like AngelList, but final negotiated salaries often differ from those initially advertised. On a case-by-case basis, such a dataset does indeed help identify instances of unfairness, but taken in aggregate, it could also point to certain macro trends that affect salary outcomes. From the over 3600 responses to the survey, I excised over 600 responses that were clearly trolling attempts or were missing significant amounts of data. I also cleaned up and standardized location names, converted local currencies into USD at the current spot price, and I coded job titles for whether they were technical or non-technical roles. Unsurprisingly, responses to this survey skewed heavily in favor of males and technical folks (reflecting the population of the Hacker News community). At least 85 percent of respondents worked in technical roles, and 95 percent said they were male. One respondent identified as Batman. 68 percent of the respondents who gave a location were from the United States and a little over a quarter of those people were based in and around the Bay Area. Before we dive in, keep in mind all of the caveats and disclaimers associated with self-reported data. Also, the Hacker News community (and, by proxy, this dataset) is not statistically representative of the software engineering community as a whole. But we can work with what we have, and see if broad trends crop up. 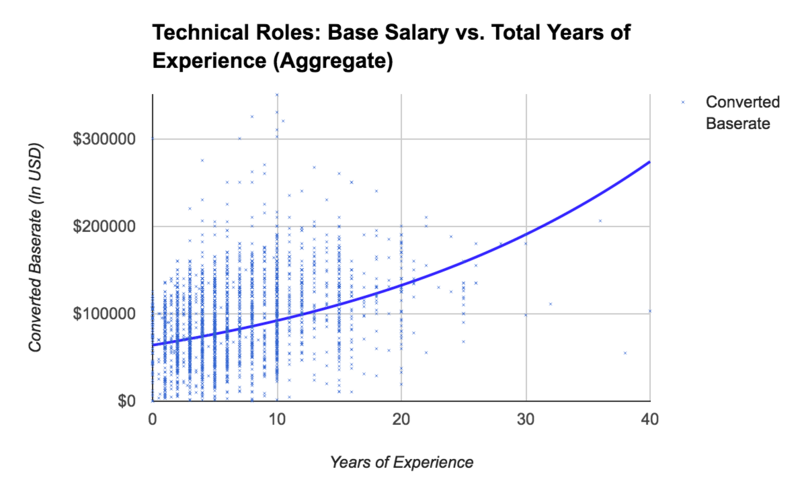 Unsurprisingly, experienced people tend to cost more money than less experienced people. What is interesting, however, is the spread between the highest paid individuals and the lowest-paid individuals for a given level of experience. The lower-bound outliers are as interesting as their inverse. Only a few dozen respondents reported making less than $20,000 in adjusted USD. Those individuals may work at companies they founded themselves or have opted for compensation heavily skewed towards equity in place of base salary. Since there aren’t enough data to explore the role that gender or other factors play in salary outcomes, we’ll focus primarily on location as our dependent variable since years of experience remains fixed. Silicon Valley vs. The Rest Of The U.S.
How does the United States stack up against itself internally? As I’ve covered in previous posts, places like New York City and the Bay Area stand head and shoulders above the rest of the US in terms of the amount of money concentrated in technology. Silicon Valley is Silicon Valley: lots of big companies, big dreams, and VCs with big wallets. But over the past 15 years or so, New York City has developed its own cadre of investors and companies that also serve to tighten up the market for programming talent. Also, both cities are expensive to live in, but you already knew that. 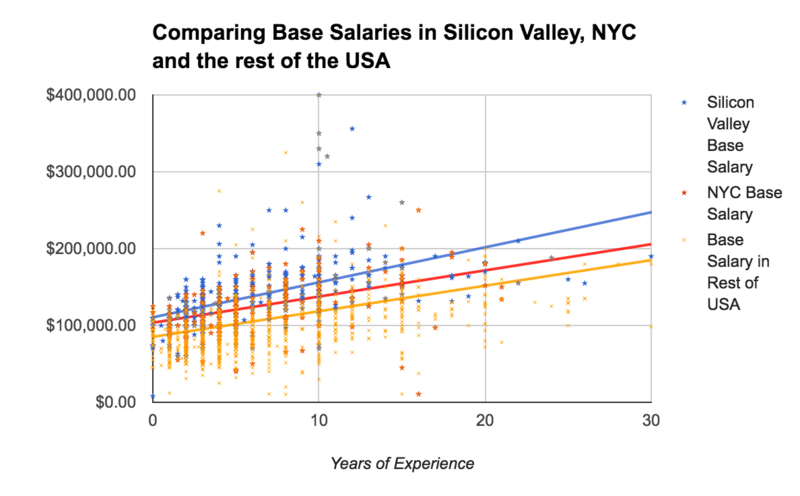 What’s interesting is how small the gap is between salaries for inexperienced developers in SF vs NYC, at least in this dataset. It’s a rounding error up until the fifth year of someone’s career. Also, if the gap between first year salaries is more than just statistical noise, it can be accounted for in the cost of living. According to a recent cost of living report from Numbeo, the cost of living in San Franciso is just around 3.4 percent higher than NYC. The roughly small gap between SF and New York base starting salaries could be a reflection of that difference in the cost of living. In other words, the competition and pricing for fresh programming talent in each of the tech industry’s financial centers is pretty efficient. However, on average, salaries in San Francisco rise slightly faster over time compared to those in NY. The Bay Area, it seems, is the better place for technical professionals who’ve earned their grey hairs. There isn’t too much that’s surprising about the rest of the US. Although there aren’t enough data to make strong claims here, salaries tend to correlate with the cost of living and density of tech companies. In our data, the average technical person who lives in Seattle makes more than the person who lives in Chicago, and the person who works in Chicago makes more than the person who lives in Nashville. 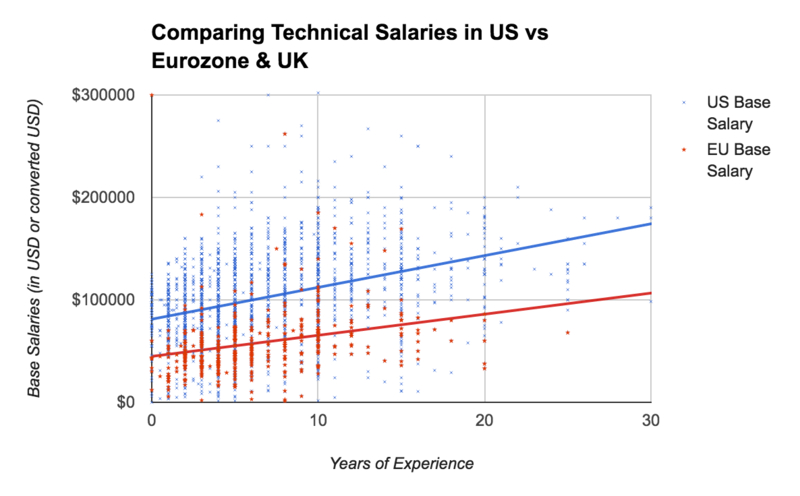 I compared the salaries of 2388 US-based technical folks against 412 respondents from Europe (including the UK, Eurozone members, and countries like Poland and Hungary which do not use the Euro but are part of Europe). On the whole, salaries for software engineers are lower for Europeans as compared to their American counterparts. In absolute terms, the average engineer in even the most expensive cities in Europe make less than their American counterparts, according to the collected data (even those technical folks living outside of San Francisco and New York City). For example, the average base salary of the 72 technical Londoners who responded to the survey is five figures more than the average base of respondents in Paris. So if generous labor laws and baguettes are important to a given developer’s quality of life, then Paris might be the place to be. If maximizing income is the priority, London may work out better. The overall European average is lowered further by countries like Romania, Hungary, Poland and Ukraine—each well-known for lower costs of living and less expensive but talented engineers. As the chart shows, starting salaries for developers in the States are higher than in Europe. That disparity continues to grow over the course of one’s career. Again, keep in mind the bias of the dataset that we are exploring; the above chart is more useful as a directional guide than an absolute oracle. In short, the self-reported data skews as we might have expected: Experience leads to higher salaries, engineers make the most in the most concentrated markets, and there is variance in Europe regarding income based on the country in question. But we did not take into full account corrections for cost of living. So while the self-reported data matches what we could have called our collected estimate, it is hard to say that an engineer outside the major tech hubs would not be not happier with a more modest salary, and far lower cost of living, than, say, an adult engineer who can’t afford a one bedroom apartment in San Francisco. Underlying all the above data from both the United States and abroad is a pent-up demand for technical talent—for salaries, the places with high demand amidst a constrained global market win out for workers in terms of raw income dollars. Determining if the lifestyle cost of that salary is worth it is a more personal question. For now, pray that you have rent control.